For many people, meal planning takes a backseat to multitude of other things that have to get done on any given day. While there are a lot of experts proposing sure-fire solutions, like any attempt at a new routine, people start strong and then fall back on old habits. Eating and serving frozen or prepared meals (which are often very high in sodium) or ordering takeout. Creating meals out of whatever is left in the fridge which leads to late night snacking because you’re not satiated. While making dinner recently, I got to thinking about how to make the most out of each time I’m prepping ingredients and had an idea. Why not prep just enough to use for another meal during the week? I realize this isn’t revolutionary, but the simplicity of it makes it something that can easily be integrated into a routine and also helps minimize waste since I know how I intend to use the ingredients and will prep the necessary amount. Plus it’s only one additional meal at a time. I thought this would make for a fun challenge so I contacted Kati at Around The Plate to ask if she would like to co-host an event where participants agree to prep enough ingredients to use for another meal during the week. I also thought some bloggers in ThePlate community would be interested in contributing their ideas on meal planning and prep ideas. When she came back with a “let’s do it!” and list of participating bloggers, the “Dine ‘N Dish Challenge” was born. So forget the leftovers and join the challenge that has you working with rollover ingredients instead! A “Healthy. Strong. Happy.” word cloud t-shirt from Words to Sweat by. A Pocket Tracker from Mora Nutrition. A full set of Words to Sweat by reusable snack bags. A 3-piece stainless steel lunch set. A bamboo BBQ roll-up set. How Do I Enter The Dine ‘N Dish Challenge? Since it takes more than trying something once or twice, we’re looking to jump start things with a 10-day challenge that we hope will turn into a longer term habit. The challenge officially launches on October 1st and ends on October 21st to give participants the opportunity to think about how to approach the challenge before jumping in and then have 10 consecutive days to complete the challenge so that the habit has time to take root. To enter, you need only comment on the official launch post on October 1st that you want to participate and then get started. The Dine ‘N Dish pledge (PDF) – sign this pledge and keep it in a high traffic area of your home to keep you accountable and motivated throughout the challenge. The Dine ‘N Dish quick list (PDF) – Plan out the meals for which you intend to have rollover ingredients and then the meals that will benefit from those already-prepped ingredients. Remember, leftovers don’t count. These need to be ‘raw’ ingredients that are saved to incorporate into a whole new meal. The Dine ‘N Dish punch card (PDF) – This is a fun, visual way to keep track of your progress throughout the challenge. Thank you Andi from Lunch It, Punch It for creating this for us! You must leave a comment on the official challenge start post (which will go live on October 1st) saying you intend to participate to be entered in the challenge. You must prep ingredients for 10 different meals for 10 consecutive days. This can be any meal throughout the day. For example, did you cut up red bell pepper for a salad with dinner? Chop up enough to include in an omelet the following day (then actually cook the omelet and eat or serve it) and voilà you’ve completed one day of the challenge. Meals previously cooked and eaten another day are considered leftovers, not rollovers. Upon completion of the 10 days and meals, you must leave a comment on the “I Completed The Dine ‘N Dish Challenge” post and pinkie swear that you followed the above rules. Make sure to check out both the Words to Sweat by blog and Around the Plate leading up to and throughout the challenge for links to meal ideas from our participating bloggers, as well as other tools and resources that will help you work on healthy new habits! For the latest updates, follow @Dinendish on Twitter. You can dish it out, but can you take it (into another day’s meal)? Join us! Hey I tweeted this and love the idea but cannot do it without planning….and I guess it is over in a few days? I often use leftovers like we had beef (pot roast) this week I then used in chili…etc. I also froze diced celery when I did a little– I just do a lot for later. This week I also cut up a three pound ham into five groups; fried for brekkie, bits for omelet, split pea soup and two packets of lunchmeat for the freezer for later. I love the concept. On the 16th a friend and I are going to do Once A Month Cooking for two weeks from the book….we shall see! Thanks for encouraging mindfulness. .-= Heather Novak´s last blog ..Tiny Red Kitchen: Whatever’s at Hand Ruebens =-. 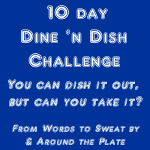 Next post: I Want Be Part Of The Dine ‘N Dish Challenge!